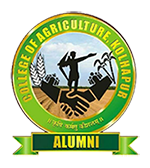 Research on the agronomic package of practices like sowing time, weed control, intercropping, varietal performance, manures and fertilizers, irrigation requirements, sowing methods and layout for different crops of the Kolhapur region is being carried out by the section and gave the following recommendations. 1 Mali. A. B. 09/024 Prof. G. B. Suryawanshi 1.Integrated Weed Management in Upland Rice. 2009 Application of Pendimethalin @ 1.0 kg a.i.ha-1 as per-emergence + hand weeding at 40 DAS. Proved to be the most remunerative in upland Rice. 3 Zende M. S. 09/028 Prof. A. B. Mohite 3.Response of Sunflower Genotypes to varying plant geometry under summer conditions . 2009 The plant geometry 60 cm x30 cm and variety Raviraj gave maximum yield in Sunflower Crop. 5 Deshmukh R.R. 10/027 Prof. M.S. Pilane 2.Response of soybean genotypes to different sowing dates in Kharif seas. 2010 Under integrated weed control methods imazethapyr @ 0.1 kg a.i. ha-1 as POE at 10 DAS + one hand weeding at 35 DAS recorded effective weed control and highest grain yield in soybean. 8 Kurane R. A. 10/030 Dr. Y.R. Jadhav 5.Response of sweet corn to different fertility levels and spacing in summer season. 2010 Application of 125% RDF (150:75:50) gave higher yield and the spacing 75 cm x20 cm proved to be remunerative in sweet corn. 9 Zambare V. N. 10/031 Prof. A.B. Mohite 6.Response of groundnut varieties to varying sowing dates under summer conditions. 2010 Sowidng on 4th meteorological week groundnut crop produced higher growth and the variety TAG-24,& TG-26 is suitable for sowing during summer season. 10 Bevara J. B. 11/028 Dr. Y.R. Jadhav 2.Response of pop corn to different fertilizer levels and plant densities in Kharif season 2011 Application of 125% & 100% RDF with 75 cm x20 cm plant spacing to pop corn proved to be remunerative, as it has recorded the maximum gross and net monetary returns along with benefit cost ratio. 12 Kamble M. A. 11/030 Dr. N. Y. Patil 3.Integrated weed management in Kharif groundnut (Arachis hypogeae L) 2011 Application of Pendimethalin @ 1.0 kg a.i. ha-1 (PE) + one hand weeding at 30 DAS + 1 hoeing at 40 was found more effective to weed control in Kharif groundnut. 13 Patil S. V. 11/031 Prof. A.S. Bhosale 4.Studies on efficient fertilizer management in finger millet (Eleusine corocana L) 2011 The gross and net monetary returns as well as benefit cost ratio is higher with application of 75 per cent RDF through briquettes to finger millet (45:22:5:00 kg NPK ha-1). 14 Patil S. P. 11/032 Prof. R. D. Nigade 5.Effect of different fertilizer levels on newly released finger millet (Eleusine corocana L) variety Phule Nachani 2011 Finger millet variety Phule Nachni showed good response to higher dose of NPK fertilizers with application of 60:30:00 NPK kgha-1 was found to be beneficial for obtaining higher grain and straw yield. 15 Rathod R. K. 11/034 Dr. A.A. Pisal 6.Yield optimization in dibbled paddy 2011 The dibble of paddy at 25x15cm to 25x15cm with Urea-DAP briquette at 170 kg +50 kg K2O ha-1 gave higher yield. 17 Garule J. B. 12/026 Dr. A.A. Pisal 3.Yield optimization in dibbled paddy. 2012 Application of Urea-DAP briquette; 57 kg N + 29 kg P2O5 + 50 kg K2O with post emergence herbicide (Almix) and per emergence herbicide (Goal) optimize higher yield in paddy. 18 Madane K. T. 12/027 Dr. Y.R. Jadhav 4.Integrated nutrient management in maize 2012 Application of 100% RDF (120:60:40 kg NPK ha-1) through inorganic fertilizers gave maximum growth and yield of kharif maize. 20 Dhonde A. S. 12/029 Prof. M.S. Pilane 5.Intercropping of Maize (Zea mays L.) + Cowpea (Vigna unguiculata) For higher production of green fodder 2012 Intercropping of maize + Cowpea (2:2) row ratio recorded significantly higher growth and yield attributing characters as well as total green fodder yield of maize and cowpea. 21 Mahadev Kumawat 12/ 030 Dr. N. Y. Patil 1.Integrated weed management in Kharif Groundnut (Arachis hypogaea. L) 2012 Application of Oxyfluorfe @ 150 g ai.i.ha-1 as PE with 1 HW at 30 DAS recorded highest B:C ratio (2.14) as compared to rest of the treatments. 22 Morey K. G. 13/279 Dr. A.A. Pisal 6.Response of Soybean varieties to nutrient management and growth regulators. 2013 Application of 75% RDF + 0:52:34 + Lihocin + Bommflower at 50% flowering found to be beneficial in increasing yield and yield attributes of soybean. 23 Suryawanshi B. R. 13/280 Prof. A. S. Bhosale 1.Effect of fertilizer levels and plant densities on growth and yield of summer green gram. 2013 Application of fertilizer 100% RDF (25 kg N and 50 kg P2O5) ha-1 with 30 cm x10 cm spacing is recorded maximum grain and straw yield of summer greengram. 26 Neha Sharma 13/283 Dr. N. Y. Patil 3.Performance of weed management in kharif maize (Zea mays L.). 2013 Application of Atrazine @ 1kg a.i. ha-1 integrated with one hand weeding at 30 DAS or 2,4-D as POE proved to be more remunerative treatment in producing maximum net returns and B:C ratio in maize. 28 Bhosale N. A. 14/025 Dr. A.A. Pisal 1.Effect of nutrient management on productivity of summer groundnut (Arachis hypogaea L.) 2014 Application of 125 % RDF was superior in recording growth parameters, yield contributing characters and yield of groundnut. 31 Wagh S. G. 14/029 Prof. R. D. Nigade 2.Nutrient Management for Finger Miller (Eleusine coracana L.) under rainfed conditions. 2014 Application of nutrients through briquettes (60:30:45 Kg ha-1) to finger miller recorded maximum grain and straw yields. 33 Jadhav V. P. 15/025 Dr. A.A. Pisal 4.Response of Sweet Corn genotypes (Zea mays saccharata sturt) 2015 sowing of sweet corn in 24 MW (11th – 17th June) is remunerative for better yield to sweet corn genotypes Sugar-75 is beneficial for higher production under kharif season in sub mountain zone. 35 Salgar S. B. 15-028 Prof. G. B. Suryawanshi 2.Integrated wed management in Kharif Groundnut (Arachis hypogaea L.) 2015 Pre-emergence application of pendimethalin @ 1 kg a.i. ha-1 + one hand weeding at 30 DAS recorded highest growth attributing characters and yield in groundnut. 36 Soutade V. G. 15/029 Dr. P U. Raundal 1.Response of little millet varieties to different levels of fertilizers under rainfed condition 2015 Application of 150 per cent RDF to Little millet variety Phule Ekadashi recorded higher yields than OLM 203.